Pravdoliub Ivanov has produced two pieces for the project Suspended Spaces #. They have both resulted from the Cyprus residency and thus from a precise experience of this place, but they go beyond just the situation of the divided island. The installation Stairs of Innocent is presented in the form of a column made of sheets of paper, affixed vertically on a very high wall. 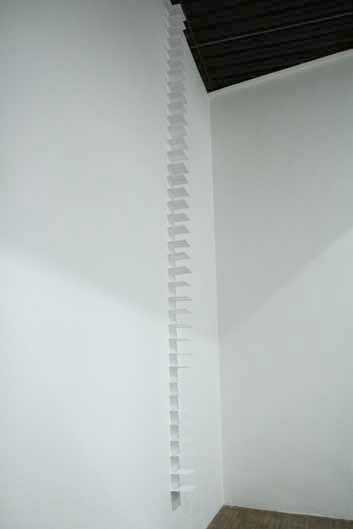 Some 40 A5 (148 x 210 mm) printed pages, each one set horizontally on two white rods coming out of the wall, and separated from each other by about 10 centmetres/4 inches, form a kind of ladder which rises up to the ceiling. 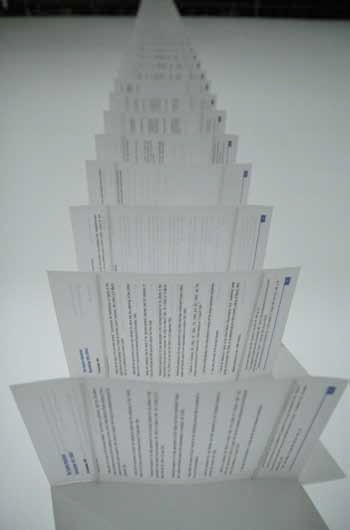 These sheets are pages of the publication containing the resolutions adopted by the UN between 1960 and 2006—Resolutions on Cyprus 1960-2006—to try and legally contain the inter-communal conflict in Cyprus, by proposing solutions and guarantees. This collection was handed out to anyone who wanted it during the residency for the project Suspended Spaces in Cyprus, by the UN representative we met. 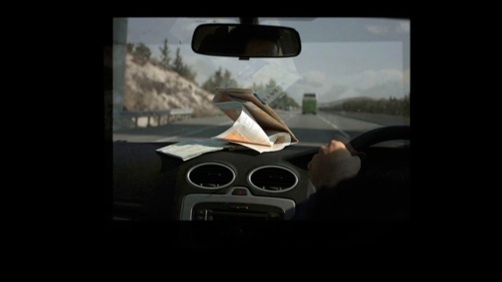 Here, Pravdoliub Ivanov attaches importance to the page rather than to what is written on it: he contrasts the procedural cumbersomeness with the paper’s lightness. This lightness nevertheless illustrates an impossible movement, and gives visitors the sensation of coming up against steps that are too fragile—so many partial resolutions, often not held to, so many failed attempts to solve the island’s problems. This staircase, which becomes lost in the perspective, seems to be endless, like a timid advance that never reaches its objective. The installation Loaded includes several suitcases that do not match, each surface of which has been emptied, with the sides and the frames still intact. Pravdoliub Ivanov has installed them on the floor of the lobby at the Maison de la Culture, whose vast area resembles the waiting room in a railway station, or some other place of passage. If the outside surfaces of the suitcases are designed to be shown to the onlooker’s eye as to accidents of journeys, the interior surfaces are more fragile, often covered with fabric, and fitted with straps and protective nets. Thus displayed, they evoke a showy intimacy. The dull violence that emanates from the skeletons of these objects conjures up forced collective displacements as well as individual fates damaged by history, deportation and exile. With Stairs of Innocent and Loaded, Pravdoliub Ivanov literally and methodically makes an extraction of the object’s function, with a simplicity and effectiveness which lend his pieces strength and an obvious quality.